The limestone terraces that make up the Aran Islands, and their unusual patterns of erosion, have given rise to some truly beautiful scenery. 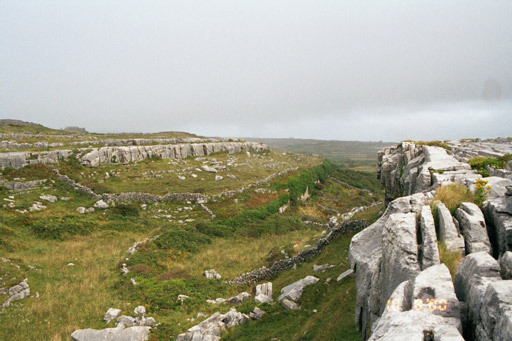 A valley near Dún Dubchathair, showing the limestone crags and their erosion patterns. 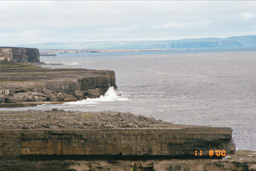 Two views of the rugged south coast of Inis Mór, where the limestone cliffs meet the sea. 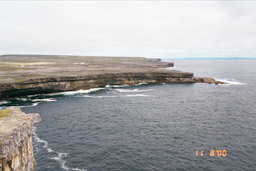 These pictures were taken from Dún Aonghasa. At low tide, some of the coastal areas expose lower terraces, carved into tidal pools and channels by the sea. In some areas, freshwater springs bubble out from beneath the cliffs, creating oases of green along the barren rock. A closer look at some of the sea cliffs from below. 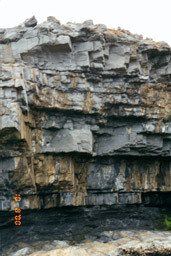 This is one of the shorter portions of the cliff; it is only 35 to 40 feet high. 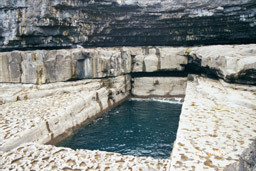 At Dún Dubhcathair the cliffs are about 90 feet high, and at Dún Aonghasa, they reach heights of more than 300 feet. 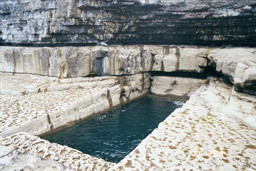 One hole on Inis Mór, however, is much larger and more imposing than the puffing holes. This has been named Poll na bPeist, which is commonly translated as "The Wormhole". But the meaning of the word "worm" (and, recently, even of "wormhole") has changed somewhat since the publication of the old Gaelic-to-English dictionaries. To better understand the name, think of "worm" in the archaic sense meaning a serpent, or even a dragon. When the high waves of a stormy sea rush into this giant opening in the rock, the churning, crashing waters must look as though an angry sea serpent were thrashing about just below the surface. As you can see from these pictures, sometimes the waters of the hole are relatively calm. The serpent must have been sleeping when we got there -- or perhaps it was out making a meal of some of the tasty local fish (or fishermen). For some reason, photographs don't clearly convey a good sense of the size of this hole. I was inspired to walk to it when I saw some pictures in the Aran heritage museum in Kilronan. They looked pretty much like the ones above, and I was expecting a hole about the size of a coffin, or maybe a bit larger. Armed with a not-too-detailed map, Sheri and I set a course by dead reckoning that involved more than half an hour of scrambling over ankle-turning, puddled landscapes of rock terraces. I was secretly a bit worried that we might miss our destination altogether. No chance of that! The hole is big -- you could drop a good-sized house into it. I'm not a great judge of distances, but I'd estimate the dimensions of the hole to be about twenty feet wide by fifty feet long. A fitting lair for a respectable sea serpent. This picture does a somewhat better job of putting the "Serpent's Lair" into perspective. 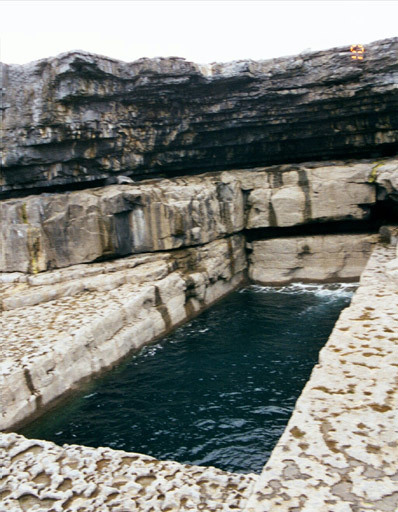 Click here to return to the Aran Islands Index. Click here to return to the Index of Pictures.